Already love Burt’s Bees lip balms, body lotions, and bug repellant? If you’ve got a baby on the way (or have to shop for one), you’re going to go “ga ga” over their new line for little ones, which launched earlier this month. 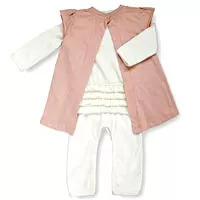 And while yes, the baby clothing is organic and the products are natural and gentle, which is such a selling point, we’re especially nuts about the price (some sets go for as little as $10—the “sleepy time” set shown here is only $20). Not to mention, you don’t have to go to a fancy boutique to purchase—the line is sold at sites like Target.com, Buybuybaby.com, and Babiesrus.com. Below, a few of our favorite gifts and sets. The ruffles are an adorable touch on these organic cotton pants ($13 for set). This bath set is only $40, making it a total looks-way-more-expensive-than-it-actually-is gift. 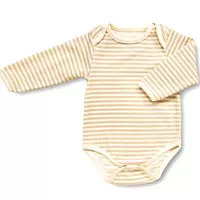 The subtle stripes on this onesie are bee-utiful ($10 for set that includes a onesie, bib, and hat).